* Define a minimal but powerful script language (G'MIC) dedicated to the design of image processing pipelines. * Provide an interpreter of this language (in C++), distributed as an open-source module/library embeddable in third-party applications. o The command-line executable gmic to use the G'MIC framework from a shell. o The interactive plug-in gmic_gimp to bring G'MIC capabilities to the image retouching software GIMP. G'MIC is focused on the design of complex pipelines for converting, manipulating, filtering and visualizing generic 1d/2d/3d multi-spectral image datasets. Of course, it is able to manage color images, but also more complex data as image sequences or 3d volumetric datasets. G'MIC is an open framework : it is possible to extend the proposed default language with custom G'MIC-written commands, defining thus new image filters or effects. By the way, it already contains a substantial set of pre-defined image processing algorithms. G'MIC has been designed with portability in mind and runs on different platforms (Windows, Unix, MacOSX). It is distributed under the CeCILL license (GPL-compatible). It has been developed in the Image Team of the GREYC laboratory, in Caen/France, by permanent researchers working in the field of image processing on a daily basis. * It internally works with lists of images. Image manipulations and interactions can be done either grouped or focused on specific items. * It can process a wide variety of image types, including multi-spectral (arbitray number of channels) and 3d volumetric images as well as image sequences, or 3d objects. Images with different pixel types are supported, allowing to process flawlessly images with 8bits or 16bits integers per channel, as well as float-valued datasets. * It provides small but efficient viewing modules dedicated to the exploration/visualization of 2d/3d multi-spectral images, 3d objects (elevation map, isocurves, isosurfaces,...), or 1d graph plots. * It proposes commands to handle custom interactive windows where user events can be managed easily. * It is highly extensible through the use of custom command files which add new functions, understood by the language interpreter. * It can be used inside GIMP, allowing end-users to integrate any G'MIC-based pipeline directly in a nice GUI, without coding efforts. * It is based on the latest development versions of the CImg Library, a well established C++ template image processing toolkit, developed by the same development team. 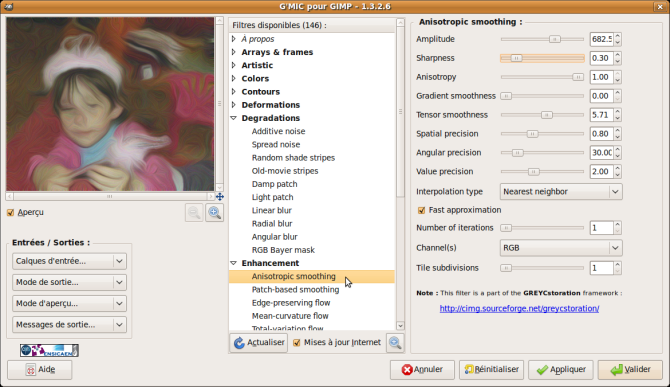 G'MIC has been made available as an easy-to-use plug-in for GIMP. It extends this retouching software capabilities by offering a large number of pre-defined image filters and effects. Of course, this plug-in is highly customizable and it is possible to dynamically add your custom G'MIC-written filters in it. Here you will find pre-compiled binaries of the plug-in for common architectures. Pick one archive below, unzip all its content into your GIMP plug-in directory, and you're done. The G'MIC plug-in should be then available from the Filters/G'MIC.. menu entry. * On Unix, the plug-in directory is usually located at $HOME/.gimp-2.x/plug-ins/.